The Special Will Be Available Simultaneously In A 10-City Theatrical Run, On All Major Transactional Platforms And Many Major Telco And Satellite Providers. 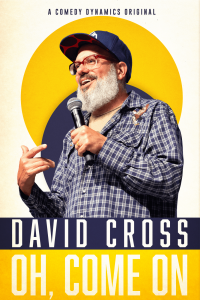 David Cross will premiere his new stand-up special, Oh, Come On, on Friday, May 10, 2019, via the Comedy Dynamics Network, which will release the special simultaneously in a 10-city theatrical run, and on all major transactional platforms such as iTunes, Amazon, Google Play, Xbox and most major telco and satellite providers including Comcast, Cox Communications, Charter Spectrum, Dish and Time Warner. The Oh, Come On special was filmed last August at The Orange Peel in Asheville, NC. The album version of Oh, Come On was recorded last November in Birmingham, AL and will be released by Comedy Dynamics available on iTunes, Spotify, Sirius XM, Google Play and at physical retailers. “Man I had such a great time on this tour and the Ashville show in particular was a lot of fun. I think this set might be the tightest and most fluid one I’ve done yet. Whether that is a result of all the colloidal silver I’ve been ingesting or just the, “Learn How To Do Stand-Up” online courses I’ve been taking, either way I think you’ll enjoy this special. If you’re a fan that is. If you are predisposed to hating me then you probably won’t like it very much.” said David Cross. “From Mr. Show to Arrested Development and everything in between, David has earned a reputation for being one of the best comedic minds of our time and his latest special proves why his reputation is 2nd to none.” said Brian Volk-Weiss, CEO of Comedy Dynamics. Cross’ 2018 Oh Come On international tour visited theatres in more than 70 cities and his 2016 Making America Great Again! tour produced theNetflix special of the same name and the Grammy nominated CD, …America…Great. In 2018, Cross returned as the beloved Dr. Tobias Fünke in Arrested Development, on Netflix, he had a recurring role in the second season of the Amazon series, Goliath, and he wrote and directed the series, Bliss, premiering on Sky TV in the UK. Other groundbreaking TV credits include The Increasingly Poor Decisions of Todd Margaret, Mr. Show with Bob and David, Freak Show, and The Ben Stiller Show. Cross voiced roles in last summer’s hit film from Boots Riley, Sorry To Bother You,and the Netflix animated film, Next Gen. In January 2018, Cross was part of the ensemble cast with Tom Hanks and Meryl Streep in Steven Spielberg’s The Post. Cross released the indie film Hits, which he wrote and directed and has appeared in numerous films including Kill Your Darlings, It’s a Disaster, Abel, Year One, Waiting for Guffman, Men in Blackand Men in Black II, Ghost World, Eternal Sunshine of the Spotless Mind, Pitch Perfect 2, I’m Not There, and he provided his vocal talents for several animated films, including Megamind, the Kung Fu Pandafranchise and Curious George. For more on David visit his website, Twitter, Facebook and Instagram.